ONLY A FEW PUPPIES LEFT. $180 each to loving, active homes. Mother is purebred German Shepherd...Father is suspected to be lab mix. Pups have been raised inside our home and are very well socialized. They have been handled since birth and should make excellent family pets. They are well started in paper training. Puppies have had veterinary puppy wellness exam, have been wormed and had their first set of shots. They will also come with some food and a blanket that smells like their mom. These puppies are available to loving, active homes and are ready to go now. A few males and females are still available. Please call or email for more info or to set up a time to meet the puppies and mom. 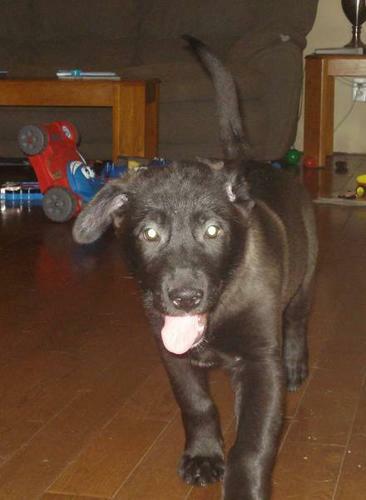 Located 30mins north of Kamloops, can deliver puppy into Kamloops for family to view if needed.